How to get relief from a headache? There are many causes of headaches including metabolic, hormonal, cervicogenic, stress, allergy, migraine, tension, or suboccipital headaches. Headaches are not independent of each other. Many of these factors add up or combine to result in many people's headaches. For example, many people develop a headache when they are more stressed out, haven't eaten for several hours, and have been sitting with poor posture. The combination of physical, chemical, and emotional stress combine to trigger a tension or a migraine headache. One theory on headaches describes them as acting on a threshold principle. All the factors that can lead to a headache at all until the summation of factors crosses the threshold, in which a series of events will lead to a headache. If several of those factors are minimized or reduced, the sum total drops below the threshold and that headache disappears. You may have felt a headache at the end of the day, then the headache disappears within a few minutes of quiet, rest and an ice pack on the back the neck. Considering there are several factors and causes for headaches, there are multiple ways to seek relief. It is difficult to affect hormonal or allergy irritants, besides the obvious over-the-counter medications. Assuming you're already taking the most basic steps, we will focus on the most common ways to reduce physical and postural stressors that lead to headaches. 1) A few minutes of quiet rest. It may seem obvious but most people don't stop to take a few minutes of rest. We continue to rush through our mornings, afternoons, and evenings at 100 miles an hour. Even with the headaches setting in, we focus on the next objective of dinner, getting the kids to bed, and wrapping up a couple extra hours of work. A few minutes of quiet rest allows the body to relax. In addition, resting the head for a few minutes will help the neck muscles to relax, and remove their contribution to headaches. 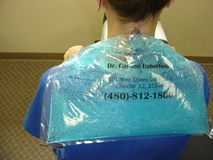 One of the easiest and most cost effective treatment options for headaches is an ice pack. Apply the ice pack to the back of the head and neck for 15 minutes. Take the ice pack off for 15 minutes, then re-apply another couple rounds of ice. Alternating ice on and off for 15 minutes helps decrease the muscle irritation and spasm. An ice pack can be used driving in the car, sitting at a work desk, and especially when resting on the couch for 15 minutes at the end of the day. It is better to ice early and often throughout the day to prevent headaches, but is often very helpful at relieving the symptoms once they start. Use your thumbs and fingertips to lightly rub and compress the upper neck and muscles at the base of the skull. Slightly compressing and rubbing these muscles in clockwise and counterclockwise motions helps them to relax. Muscle spasms of the trapezius and cervical paraspinal muscles pull on the neck joints that send pain signals to the brain, activation of the pain nerves can lead to postural or tension headaches. Rubbing these muscles for a few minutes at a time helps to decrease the spasm and their contribution towards your daily headaches. 4) Focus on posture during the day. Sitting with your head down and forward at a computer or desk increases the stress and strain on the neck muscles and joints. For every inch the head leans forward, the neck muscles need to work harder during the day to hold your head up. Over the course of a day's work the strain on the muscles becomes significant and leads to many afternoon and evening posture tension or migraine headaches. Focusing on posture helps reduce the stress and strain on the muscles, which further reduces the likelihood of developing a headache at the end of the day. Once the headache starts, improving your posture may help slow its intensity. Focusing on proper posture early in the workday reduces the chance of developing an afternoon or evening headache. 5) Light neck range of motion exercises and stretches. Keeping the muscles and joints loose and moving is a great way to prevent headaches. Strained joints and muscle spasms send painful signals to the brain and are a major contributor to afternoon and evening headaches. Sitting with your head down and forward toward the computer increases the strain on the joints and the pain signal is sent to the brain. Our joints were designed to move, and when they don't move pain signals travel to the brain to get you to change positions and postures. Most of us are used to overriding the discomfort associated with sitting and end up sitting for hours at a time. A few minutes of light neck exercises and stretches prevent pain signals from being sent to the brain (Example of Neck Exercises). Start by sitting upright and in a neutral posture. Slowly look over your left and right shoulder 10 times. Then return to the neutral position and look up and down 10 times. Light neck stretches can then be performed with pulling the eyes and nose towards the left knee for 15 seconds, and then repeating towards the other knee. This will stretch both the left and right neck muscles. Performing these light exercises and stretches once an hour significantly reduces your chance of developing a headache and can also help reduce the intensity of a headache after it's begun. Those are some simple ways to get relief from headaches. However if you find your headaches are occurring more than one or two times a month, you may benefit from specific treatments designed to decrease muscle spasms and increase joint range of motion. Chiropractic treatment is a great for increasing joint range of motion and decreasing muscle spasms. Chronic sitting and poor posture often causes small sprains or strains in joints and suboccipital muscles. These send pain signals to the brain that contribute towards our headache threshold. Chiropractic adjustments increase the joint range of motion and stop the joints from sending pain signals. Physical therapy exercises and stretches enhance muscle flexibility. There are different types of chiropractic adjustments that help restore joint motion. Many people are familiar with the manual adjustment, which produces the popping sound. There are also some very light force techniques utilizing the activator or drop tables that increase the motion and are often less scary for the first-time patient. They are also great for patients who have significant amounts of arthritis or are in severe pain. The best chiropractic adjustive techniques is the type you feel the most comfortable with. Massage therapy is an excellent treatment for decreasing muscle spasms that contribute to headaches. It can be used on the muscles in the front of the neck including the scalene and SCM, in addition to the trapezius, cervical paraspinals, and some groups of the muscles in the back of the neck. Decreasing muscle hypertonicity or spasm enhances range of motion and reduces the likelihood of headaches. 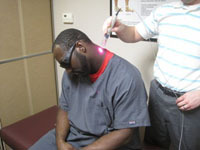 Class IV cold laser therapy is also a treatment used to improve headache symptoms. Specificn wavelengths and frequencies stimulate blood vessels in the back the head and neck to dilate and reduce fluctuations or strain on the tissues in the back of the head. These wavelengths can also help minimize inflammation or irritation around the nerves that contribute to tension or migraine headaches. Many patients who suffer from headaches related to posture, work activities, and home activities respond very well to a combination of treatments that include chiropractic, physical therapy, and massage therapy. Combining these treatments as a group addresses all of the components that lead to musculoskeletal or mechanical-based headaches. Tension or migraine headaches are often the result of multiple factors adding up or contributing to reaching a threshold. Finding ways to minimizing these factors helps reduce the likelihood of developing a headache, and can also be used to stop a headache once it has begun. The simple steps can be used throughout the day for prevention. If they are not enough, additional treatment can be sought by a provider who specializes in headache treatments.